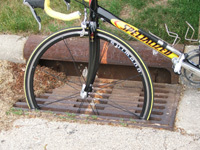 Bicycle tire in a drain grate. Road conditions such as potholes, debris, drain grates, cracked or uneven pavement, railroad tracks, and overhanging vegetation can upset a bicyclist's balance and cause a fall. Swerving to avoid a road hazard may also result in crashes with fixed objects, other bicyclists, or motor vehicles. Collisions between bicyclists and motorists are usually the most serious. In 2011, 677 bicyclists were killed and 48,000 were injured in reported crashes with motor vehicles in the United States. Decreasing road hazards decreases the chances that a bicyclist will be involved in a crash and creating a road that is safer and more comfortable to ride can attract new bicyclists. Road crews are seldom trained to identify and repair bicycle road hazards, so they focus on motorist hazards. However, by the time something is hazardous for motorists, it has long been a danger to bicyclists. For example, a 1/2-inch-wide crack in the road that runs parallel to the direction of travel will not present a problem to a motorist, but it is sufficient to cause a bicyclist to fall. Bicyclists are often reluctant to report road hazards because they do not know how to do it or they don't believe that reports will lead to repairs. It is often difficult for bicyclists to identify which jurisdiction, such as the city or the county, has the responsibility for maintaining a given section of road. The Road Hazard Identification Pilot Project was developed and tested for the Wisconsin Department of Transportation in the early 1990s. Local sponsors were the Village of Howard and the Bay Shore Bicycle Club. Before the pilot program, there were no organized efforts, either public or private, to identify and repair bicycle-specific road hazards in the Green Bay area. The project was based on similar "spot improvement" programs developed in Seattle, Chicago, and Madison. The goal was to develop a system which could be used by public or private entities to easily and inexpensively facilitate the identification and repair of bicycle road hazards. The program was designed to improve bicycle safety as well as coordination between road users, road crews, and decision-makers. The greater Green Bay area, consisting of six municipalities ranging in population from 1,400 to 96,000 within Brown County, was chosen to pilot test the project. The pilot project ran from June through September 1995 in the greater Green Bay area. Road Hazard Identification postcards that could be used to report hazards were distributed to the public through bicycle shops, bicycle clubs, recreation departments, county, city, and village offices. After a card was completed it was mailed (at the sender's expense) to a central location where the hazard identification information was entered into a computer database designed for the program. The database allowed the hazard to be tracked by the project coordinator from the time it was reported until it was repaired. The database also assisted in identifying which jurisdiction was responsible for repairs, and in creating hazard reports which were sent to affected jurisdictions. Following data entry, the card was given to a trained volunteer who checked the card and hazard for accuracy and validity via a site visit. Two weeks after hazard reports were forwarded to jurisdictions, repair status updates were requested. The project coordinator contacted jurisdictions personally for subsequent status reports. One of the Road Hazard Identification postcards used in the pilot project in 1995. 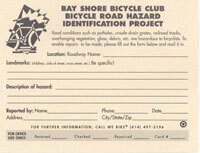 Bicyclists and other road users can still report hazards using postcards. Prior to the implementation of the pilot project, volunteer inspectors were identified and trained, public works directors and the County Highway Commissioner were consulted, and specialized bicycle road hazard training was offered to each jurisdiction involved. Road Hazard Cards were tabulated to determine the number of hazards reported and the repair status of these hazards. Hazard inspector activity was analyzed, and bicyclists, inspectors and public works supervisors were surveyed about the project. During the four-month pilot project, 120 hazards were reported. Of these, 23 were repaired or deemed unrepairable. The "unrepairable" designation usually referred to minor streets that were in poor shape but that were not scheduled for resurfacing for several years. The other common situation was where a sheet of concrete road surface had risen up or subsided and, because of the excessive cost of repair, the repair would not be made until the situation became much worse or, more likely still, when the entire road was replaced. Without major road work, 67 hazards were scheduled for repairs and the remaining 30 hazard repairs were in progress when the pilot evaluation ended. Twenty-four different bicyclists reported hazards during the pilot project. Reporters tended to be experienced bicyclists, often commuters, who reported hazards primarily on busy, narrow collector and arterial streets. An increased rate of hazard repair because of increased awareness among road crews. Less critical attitudes of bicyclists toward public works departments. Continuation of project following pilot test. A lot has changed in the Green Bay area since the Road Hazard Identification Pilot Project in the mid-1990s. When the program began, recreational trials and bicycle lanes were nonexistent, and the public had a very low level of bike safety awareness. Beyond the scope of specific project activities, the program was instrumental in starting conversations and discussions about bike safety between different government agencies and the public. Although the Road Hazard Identification Pilot Project disbanded once funding ran out, the mechanisms for reporting road hazards have stayed in place. Today, the public has access to phone numbers and website-based forms for reporting hazards to the different municipalities, and they still have the option of mailing in postcards if they prefer. At the same time, formal design guidelines issued since the 1990s have eliminated some of the road hazards that were common at the time of the program. Wisconsin state guidance released around the time of the project prohibited the parallel-slot drain grates. At the time, many local public works departments were unfamiliar with the guidance, but today, all parallel-slot drain grates have been removed and replaced. Also, today most roadways are built with an integrated gutter that eliminates a bicycling hazard that was once very common. As design standards improved, roadway safety for bicyclists also improved. A formal system for identifying road conditions that are hazardous to bicyclists is important for improving bicyclist safety and enjoyment. The Road Hazard Identification Project proved to be an inexpensive and effective means of identifying and facilitating the repair of bicycle road hazards. This program, or a similar one that incorporates bicyclist and professional training and input, would be valuable in any community. The main costs involved in developing a Road Hazard Identification program were project coordinator training and research (about eight hours), computer database setup (about eight hours), inspector and public works trainings (about three hours) and advertising (about three hours). The project coordinator and public works coordinator each spent about two hours per week on the project. Funding for the project was provided by the Wisconsin Department of Transportations Bureau of Transportation Safety using Federal Highway Safety (402) Funds. The total cost of the project, including development and the pilot test, was $9,615.